Drunk driving is one of the major causes of road accidents resulting to deaths or serious physical injuries. To address this problem, the government implemented blood alcohol testing by roadside which may be done randomly by the police authorities. Blood alcohol testing is a procedure conducted by measuring the amount of alcohol in the blood of those drivers suspected of driving under the influence of alcohol. Anyone flagged down by the authorities and subjected to a random blood alcohol test must comply with it. Otherwise, you will be charged with refusal to undergo blood alcohol testing, which may result in suspension of your license. The amount or concentration of alcohol in your blood must be within the range permissible for the kind of license issued to you. In some states, if you are holding a license for learner or provisional, zero blood alcohol content must be exhibited, otherwise, you will be tested positive for alcohol. There are different ways to test yourself for blood alcohol content. It may be through a breath Analyzer test or through your urine. In either way, it is important that your test will result to a negative one or else you will be facing the legal consequence of it and then lose of your driver license.If you were tested positive, you can still question the result and allege irregularities in the procedure conducted or in the handling of the specimen. This however can be raised during the hearing of your case in court. 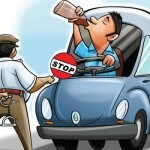 Hence, to avoid the hassle of being charged with drunk driving, follow the law and live hassle-free.